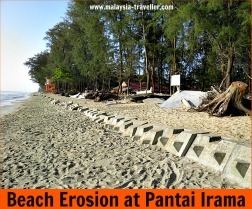 Coastal erosion has taken its toll on Pantai Irama, once rated as the most beautiful beach on Malaysia's East Coast. 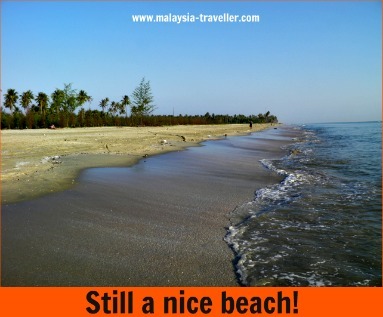 This beach, also known as Beach of Melody, is located in Bachok District, about 25km south-east of Kota Bharu. 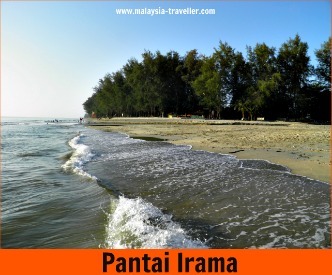 It is generally regarded as Kelantan's top beach but over the past decade or so it has suffered from coastal erosion, in common with many other east coast beaches. Attempts have been made to control beach erosion by means of lining concrete blocks (revetments) along the edge of the beach but heavy storms in recent months have damaged some of the gazebos and structures along the beach front (as you can see in this photo taken in March 2012). Despite this damage it is still a nice beach with soft clean sand once you move away from a somewhat smelly stream which drains into the sea. There was some litter on the beach which unfortunately is inevitable as this beach gets busy at weekends and holidays. The water was fairly clear but sandy brown colour. I enjoyed my swim here but afterwards noticed a sign warning that bathing and playing at the water's edge is prohibited from November to March due to rough seas. Luckily the sea was calm and warm that day which was near the end of March. (None of these were open during my visit but it was the off-season and early in the morning). The location is marked on the interactive map on the Beaches & Islands page. If you are driving yourself, stay on the coast road and follow the signs to Bachok. The beach is about 1km north of Bachok. Or you could take Transnational Bus Numbers 2 or 23 from Kota Bharu. Cost RM2.70. A taxi from Kota Bharu should cost around RM15 one way.